President Trump has issued an executive order attempting to eviscerate protections for the Northeast Canyons and Seamounts Marine National Monument off the coast of New England — opening these pristine waters to destructive commercial fishing and threatening deep sea corals, whales, dolphins, seabirds, and other fragile wildlife. This latest move is part of the Trump administration’s ongoing efforts to shrink and weaken protections for dozens of our country’s most treasured national monuments, public lands, and waters. Congress can play a critical role in this fight to prevent President Trump from rolling back protections for this and other marine monuments and sanctuaries. But they need to feel pressure from their constituents like you. 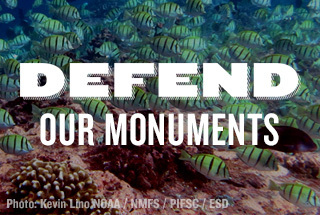 Tell your senators that you’re outraged by this attack on the Northeast Canyons and Seamounts Marine National Monument — and demand that they stand firm against Trump’s assault on our oceans, and all of America’s public lands and waters, before it’s too late. Tell your senators to demand that President Trump and Commerce Secretary Wilbur Ross stop their assault on our cherished ocean places. Dear Senator: Please act now to stop President Trump from eviscerating protections for our cherished marine monuments and sanctuaries, including the Northeast Canyon and Seamounts Marine National Monument. Trump’s move to eliminate protections for the Northeast Canyons and Seamounts and Secretary Zinke’s recommendations to roll back protections for additional marine monuments endanger some of our planet's most fragile ocean waters; threaten countless endangered whales, seabirds, ancient corals, and thousands of species of vulnerable marine wildlife; and jeopardize the livelihoods of coastal communities that depend on a healthy ocean ecosystem. These assaults on our majestic waters are unconscionable and downright dangerous to the future of our oceans. Members of Congress like you can help stop this assault -- by demanding that President Trump reverse course and keep our Marine National Monuments, National Marine Sanctuaries, and other wild places protected for the American people, not industrial users and polluters. Thank you.